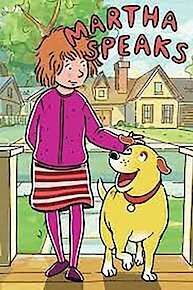 The animated young children's show Martha Speaks is about a dog who can speak after eating alphabet soup. Martha is owned by a ten year old girl named Helen Corraine. They live in Wagstaff City, which is modeled after Flagstaff Arizona. The series is based on the children's series written by Susan Meddaugh. It was adapted to television by writer Ken Scarborough. The executive producers are Carol Greenwald, Chris Bartleman, and Blair Peters. They have also produced other animated children programs. Susan Meddaugh works with the producers regarding the selected words showcased in each show. One day Martha is accidently fed alphabet soup and discovers that she can talk. Martha learns that she loves to talk and has an extensive vocabulary. Helen's other dog is not able to speak after eating the soup. Martha, however, has the problem of giving unwanted advice, thus getting herself into trouble. Also if Martha eats from the bottom of the soup can, she will say one thing but she would have meant to say the complete opposite. Martha is also an expert in animal languages too. Her friend Helen has the job of trying to keep Martha out of trouble. Helen has both human and animal friends that round out the cast. Around 20 new words are featured in each show. The object of the show is to teach children meanings of words before they can read them. It is the first stepping stones of building a large vocabulary and an introduction to early reading skills. Tabitha St. Germain is the voice of Martha and Madeline Peters is the voice of Helen. The show is narrated by J.T. Turner. The theme music and the music used in the show is the work of composer Daniel Ingram. Ken Scarborough wrote the words to the theme song. The series originated in both the United States and Canada. Eyes on the Skies: Astrophysicist Neil DeGrasse Tyson is holding a seminar at the library. Truman becomes more and more certain that his activity partner T.D. is going to embarrass him in front of his idol. Camp Truman: Milo is super-exited to go to Camp Winnetka this summer. But when Truman discovers that Camp Winnetka is closing, he takes it upon himself to cheer Milo up! Martha's Thanksgiving, Part One: When Martha learns that Helen's extended family will be coming for Thanksgiving, she decides to search for her own long-lost canine siblings. Martha's Thanksgiving, Part Two: Still in search of her mother, Martha digs into her past to uncover the reason they were separated. T.D. Gives A Report: When T.D. finds out the Pony Express wasn't a train for horses, he's crushed. It was the only thing worth doing a report on for Mrs. Clusky's class. Martha's Canine Cleaners: Lily needs help. She tore a pillow while she was sleeping. Canine Cleaners Martha and Skits answer the call€¦and make things a whole lot worse. Tomato, You Say: Why is there a tomato on T.D. 's shirt? Helen's eager to know. Unfortunately, she'd have an easier time getting Martha to skip breakfast than getting a straight answer from T.D. Martha Questions: Is Martha only speaking in questions? Why would that be? Will the questions ever stop??? Episode 14 - April Fools/Bully For You! April Fools: It's April Fools' Day in Wagstaff City and T.D., the King of Pranks, is€¦too busy to plan pranks? Bully For You! : A ferocious new pooch has the neighborhood dogs' fur on end. Martha may never go outside again. Can anyone neutralize this bully's bark? Bookbots 3: Fit Fights Fat: No cat is stronger than a Bookbot€¦unless the Bookbots are out of shape! And with little crime to fight, our heroes have become just that. Grandpa Bernie Cleans Up: When the dogs join Helen and T.D. to clean Grandpa Bernie's garage, they meet Candy, an elderly dog who claims she was bit by a ball from outer space! Alice Tells a Story: When Alice tells the story of how she got Nelson, her class is confused. Pirates and Princesses: Princesses Carolina, Alice and Helen needeth a castle. Skipper Truman and First Mate T.D. are scouring the land for a ship. The problem: Helen only has one tree house. The Return of Ralph: Buying a bigger TV usually means a better entertainment experience. For the Lorraine's, it means the return of Ralph, the conniving duck! Little Bo's Sheep: Martha can't figure out why there's a sheep in her kitchen until Bo, a border collie, rushes in to explain that they got lost on their way to a herding festival. Stanley Saves the Day: Kenan Thompson guest stars as Truman's cousin, Stanley, whose obsession with watching movies tends to get on his cousin's nerves. Milo Goes for Gold: Milo never wins anything. Tired of being trophyless and second-bested by his friends, he devises a way to triumph by making up his own games. Mouse Patrol: Mice have invaded the neighborhood and Martha's here to help. Her rodent-ridding skills are superb, but once she gets to know these friendly, furry nomads the job gets complicated. The Big Knockover: Trash cans are being knocked down across Wagstaff City and Mrs. Demson knows just who to blame: dogs. My Mother the Dog: Inspired by Ronald's parrot, Martha starts doing impersonations. But when she starts answering phone calls in Mariella's voice, she gets a bit more than she bargained for€¦ Martha's Must-Have: When Martha finds out that wearing a Courageous Collie Carlo Collar makes people give you food, she has to have one. The Puppy Show: TV producer Laslo Huckey knows just what people want to watch: puppies. But puppies doing what? Never Forget to Remember: It's the first day of spring and everybody wants to play their favorite outdoor game, Kickup! Only, where's the ball? The Puppy Tooth Fairy: Martha is hit with a stark realization: the Tooth Fairy doesn't like dogs. Determined to right a wrong, Martha and Skits bound boldly into the night as the Puppy Tooth Fairies. Martha's Blue Period: It's impossible. It's unthinkable. It's unbearable. Helen is leaving Martha and going to art camp. Episode 2 - Puppy Skits/Dinosaurs in Trouble! Puppy Skits: Can a dog break through the space-time continuum? T.D. thinks so. Dinosaurs in Trouble! : Due to a lack of funds, the museum's fossil exhibit is closing and Milo and Truman are devastated. What's more fun than fossils? Can the Mesozoic enthusiasts find a way to save the dinos? Monkeyshines Martha: Helen's hefty schoolwork load leaves her with little time left to spend with Martha. Dog Daze: When Carolina chastises Martha for her doggish mannerisms, Martha wishes Carolina could just see things from her point of view. Return of the Bookbots: The Case of the Missing Words, Part One: The Bookbots are back and faced with a new nemesis...The Announcer! Return of the Bookbots: The Case of the Missing Words, Part Two: The Announcer is still at large and has put the city into grammatical peril. Fortunately, the Bookbots have discovered a secret weapon: adjectives! Martha's Market: Martha pitches in to run Tio Jorge's market when everyone else is busy. Will Martha and her canine coworkers be able to satisfy their customers' needs? Bye Bye Burger Boy: Burger Boy, the gang's favorite childhood restaurant, is going out of business. Can Martha and Friends' advertising campaign save their local eatery? Bulldozer Versus Dinosaur! : T.D. ponders the age-old question: what's more powerful, a bulldozer or a dinosaur? Carolina Tackles Football: The Wagstaff Dogs are tired of losing every game. In their search for new leadership, the gang is shocked to discover a fanatical football coach in...Carolina? Verb Dog, When Action Calls! : Struck by a falling book of five-hundred-and-one English Verbs, Martha instantly becomes - Verb Dog! Martha's Adverb Adventure: Weaselgraft and Pablum have a new invention that is sure to make them rich again. Billy Collins Speaks: Billy Collins writes great poems about dogs, and Martha thinks she knows why. Milo's Reading Buddy: When Milo reads in front of other people he gets nervous. T.D. has the perfect, confidence-building solution: a Reading Buddy! Martha's Slumber Party of the Weird: The gang is camping out but they aren't tired. When TD suggests they tell science fiction stories, no one expects this story to end as it does: to be continued! Return to Martha's Slumber Party of the Weird: A shadow on the outside of the tent inspires still more stories. Patrol Dog Martha: Martha wishes she could help solve crimes like Rascal the police dog, and she's in luck! Officer O'Reilly lets Martha fill in while Rascal is away. The Crooning Crook Caper: Helen wishes she could be a kid detective just like her favorite book character, Curious Crystal. Martha: Secret Agent Dog, Part 1: Martha is on a super secret mission to find out who's trying to steal the formula for Granny's soup. Martha: Secret Agent Dog, Part 2: The life of a secret agent dog turns out to be trickier than Martha expected. Undaunted, Martha uses disguises and gadgets to hound the evil soup thieves. Paws and Effect: When Martha gets a piece of glass in her paw, everyone realizes that littering hurts more than the environment. The Trouble with Teddy: Teddy, a neighborhood dog, is sick, and the vet doesn't know why. When Martha is called in to consult, even she can't diagnose the patient. Martha Speaks is currently available to watch free on PBS Kids and stream on PBS Kids. You can also stream, download, buy, rent Martha Speaks on demand at Amazon, iTunes online.